Hi everyone, while I’m on a quick holiday, my brother is looking after the store, house and pets (didn’t volunteer for the baby), and a couple of amazing ladies are guest blogging. Rachel is my IRL sewing friend, and you can’t NOT get excited about sewing when you’re around her. Her garments are gorgeous and very wearable, and her quilts are stunning. If that’s not enough to make you jealous, ask her how much liberty fabric is in the stash…. Hi guys! It’s Rachel here from My Messings, and I’m very excited that Sarah asked me to guest post while she’s away on her fantabulous holiday! I hope you’re having a great time Sarah! It’s shorter, slimmer and infinitely more flattering! I absolutely love this skirt now, and it’s one of my favourite skirts to wear, even being the bottom half of my job interview outfit. Remaking this skirt made me realise that a well fitting pencil skirt makes me feel really sleek and slim, whereas the ill fitting one made me feel like a pear-shaped-blob. My second example is my “Esprit dress”. This dress was originally inspired by a dress I tried on in the store Esprit that was just beautifully, and fit so well through the body until I got to my hips, where it was too tight and a disaster. This one was actually made waaay back in late 2009. I drastically modified a pattern I already had to add in the style lines of the inspiration dress, and after making a muslin then made some ill-advised alterations – I thought it was too tight so I altered the pattern accordingly… however when I then made the dress I turned out waaaay too big and incredibly sack like! Again, it got worn once to ‘give it a chance’ and then shoved into the back of my wardrobe for a while, until I could consider how to resolve it. You see, I couldn’t just take it in at the side seams because of the pockets I’d added – if I took it in as much as I needed to I would have made the pockets unusably small. 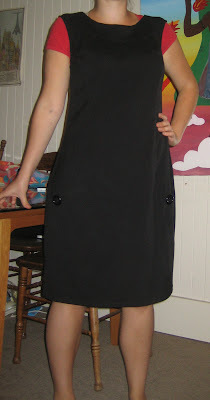 I took it out again in April of 2011 and my dear friend Mindy made the clever suggestion of hacking off some of the hem. I did just that; 4 inches shorter and the dress was transformed! It’s still loose, but it has bust and waist shaping, so it isn’t completely sack like, but the shorter length gives it a real 60’s shift dress feel. And you know what – it’s super comfortable and really versatile; again it’s become one of my favourite garments. 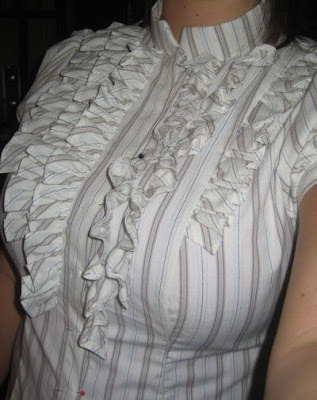 However, I was always on the fence about the ruffles on this shirt. When I first made it I wasn’t convinced, I didn’t like how much extra volume they added to my chest. However, as with my other problem makes, I wore the garment once to give it a chance, and then washed it. Now that sealed the fate of the ruffles! They came out of the washing machine in a complete state! All crumpled up and looking nothing like the crisp ruffles I’d made to start with. And with how tightly they were gathered I couldn’t see a way to iron them so they looked ok again. Instead, I took it as the perfect excuse to remove the ruffles entirely! Now I love this shirt! As you can see, most of these items were made not long after I started sewing in earnest in 2008/2009. I think they’re worth talking about because it really does show that until you’ve got some experience under your belt you will make mistakes. Of course you will, everyone does! I still do! Giving myself some time to get over the initial sting of the item not quite working out as I’d hoped gave me the perspective to fix them, and therefore not waste the effort, time and resources that went into them. Thanks again to Sarah for inviting me to post! I hope you’ve all found it interesting. I’m really looking forward to finding out who else is posting while she’s away and reading what they have to say! Great post, Rachel. It can be disheartening when a sewing project doesn’t work out first time. Putting it away, then trying to re-model it, later, can be very effective – and renews your sewing confidence! Great blog, Rachel. It can be very disheartening when a sewing project doesn’t work out as planned. Good on you for turning mistakes into successes! Reduce, reuse, recycle. Stunning Rachel great post.